at something new in Swift 4.
that I'm using so you can follow along if you want to. of, how do you parse JSON and Swift? less strongly typed world of JSON. and so transferring between the two is difficult. that we can work with, we'll call it beer. and let's say a brewery which will be a string. So that's what we wanna start with. and the brewery is Saint Arnold. a beer and it does. So we wanna turn this into JSON. So to do that we can use the new codable protocol. protocol is actually a decodable and encodable. that this type is the union of those two other types. is actually a combination of these two other types. protocol, but if we wanna do both then we use codable. and I will create a new instance of that. Then I'll call JSON decoder dot decode. And I have to give it here a type and a data. a JSON encoder, I'll call that encoder. and I paste in a value here that is encodable. So that value here is going to be my beer. And it is encodable because it adopts that codable protocol. try and that's gonna give me back a data. is going to have some data in it. It has 55 bytes, we can see that here. And so now we can just print this out. So let me get a JSON string out of that. and I'll just print that to the console below. And you can see here that we have our string. Let me force unwrap that so we get a nicer look at it. There we go, there's our string. were defined here, it looks really good. which we already saw and there's pretty printed here. that are a lot easier for us to see. as another string so that we can do the reverse. into another beer instance based on the string. So let's call this input JSON. you're supposed to use double quotes here. Now it has to be vertically lined up like I did here. are the extra white space past that mark. when we're creating multi-line strings. a different delimiter for our string. about stripping leading white space. And basically preserving whatever formatting you want. call data using encoding and pass in utf8. So we're going to create a new JSON decoder. that we're gonna decode a particular protocol. or the type that we wanna get back. because I know it's gonna exist. And again, this call can fail. we can use dump to dump all the properties of our beer. and we turned it into this object. So it grabbed everything that we needed. it's just given to us for free. So I'm gonna talk about some of the differences here. a beer style that is a beer style enum. but I'll just leave a few for now. So now it's complaining because beer is no longer codable. but our beer style does not. and it will figure that out. the raw value is on our enum. and this is a kolsch style beer. doesn't include that value and we said that it's required. having no default value for this. that we said that were required in the type. a Swift error that we can catch if we want to. as well as the debug description. 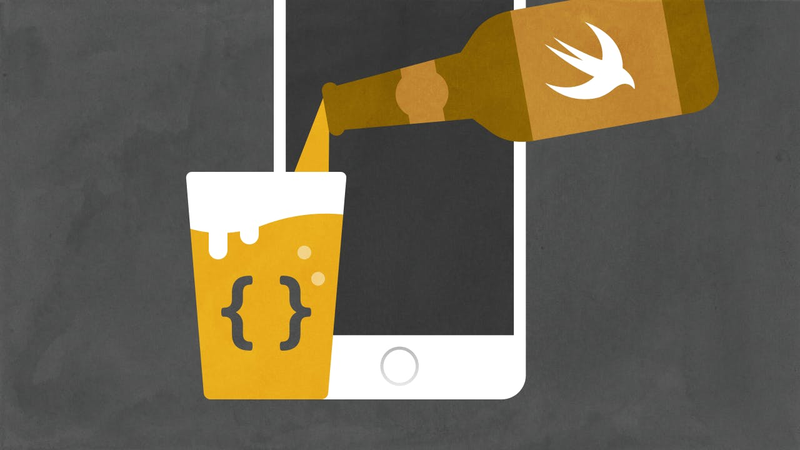 beer style for coding key style. this is all stuff that we can catch if we want to. a comma there and just add in our style of kolsch. Okay, we're back to parsing successfully. and brewery has a name property which is a string. we'll create the brewery with a name. And then we'll have to do the same thing here. This brewery is now gonna be an object with a name. Now, how did it know that we wanted an object here? creates what's called a keyed container. it has keys and values. in an array or in a collection, it doesn't have any keys. which is this nested style. Most APIs use Snake case for their API names. but that's not good Swift style, that looks pretty ugly. Let me finish this so we can get this compiling. because I already think it's ugly. like Ruby, but in Swift we don't expect that. it generates that and that's not what we expect. what the API would typically send us? what the compiler has inferred for us. that's attached to our beer and this has been given to us. and it probably doesn't compile, it might be private. But we can specify this ourselves. if you want to customize what the key values are. So we now need a case for each one of these. for each one of these instances. that just matches the convention. to a different value here. Okay, we are back to compiling. JSON key is parsed exactly as we want it to. It's encoded exactly like we would expect. static JSON to have that value. So we're gonna say, created at and then we'll do colon. to have ISO 8601 formatted date times. is a site that I made. and you can play around with them here. So this is using actual NS Date Formatter on the server. properly, but we're getting a different error now. and then it gives us back that context. a string slash data instead. should be formatted in that style. of one of these different strategies. And one of them is ISO 8601.
the Z at the end. Let's see, what were we looking for? that we have the date decoding strategy of ISO 8601.
not being able to pass in the time zone offset there. Now that should also work. which I think stands for Zulu, but I digress. And we did that with really minimal code. was this coding keys thing. and how they've implemented this. by the compiler is really awesome. and we'll see you again next time.